Paper Artist Nancy Akerly Liberty Grove Paper Arts at her home studio in Sister Bay Wisconsin. Photo by Len Villano. 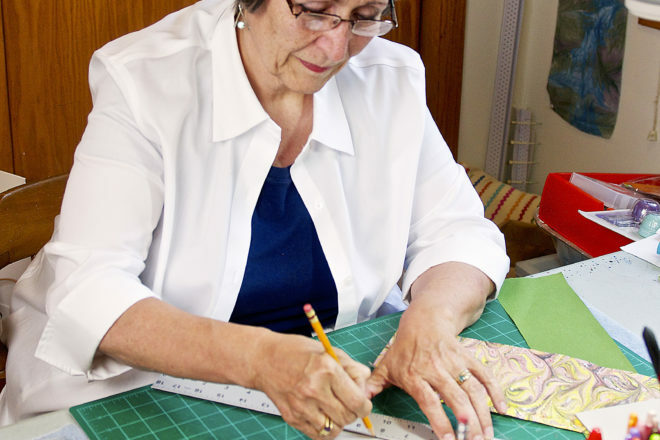 Nancy Akerly first learned origami during a Chicago park program when she was just eight years old. Since then, she has continued to pursue her love of paper arts, expanding her skills to include bookbinding and making paper-covered boxes. She also added marbling to her repertoire, an ancient practice that dates back to at least the 12th century. The art of marbling spread to Turkey in the 14th century. There it was known as “ebru,” or “cloud painting.” The marbled papers were used for decorative purposes but also as background for official documents and signatures to prevent erasure or forgery. Some of the oldest papers still in existence, which date back to the 1500s, are decorated with flowers in a style known as figure marbling. From there, marbling spread to Europe. Each country developed its own unique patterns, including Italian Vein, Spanish Wave, and French Curl. In order to protect their craft and their livelihoods, artisans and guilds kept their marbling techniques secret. It took an apprentice seven years to learn the entire marbling process. 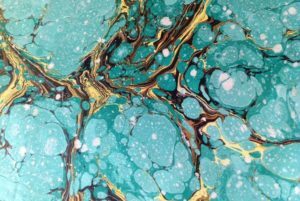 In the late 1800s, marbling was in danger of dying out, as mass production on modern printing presses no longer fueled a demand for the intricately designed paper. A few marblers decided to publish their long-kept secrets in an effort to keep the art form alive. Since then, it has had a revival among paper artists, including Akerly, who began marbling her own paper to use in the creation of her books and boxes. A stone marble, printed using a Spanish Wave technique. “I like the loose wavy appearance that makes it appear to be fabric,” Akerly commented. To start, one must fill a tray with one inch of size, which is a viscous substance made of carrageenan. Carrageenan is an extract from Irish moss often used as an emulsifier in ice cream and pudding. When Akerly first tried her hand at marbling in the ‘70s, extracting the carrageenan was a tedious part of the process. 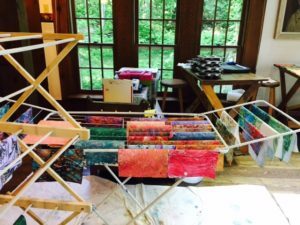 Marbled papers drying on racks during a marbling class at The Clearing. “Always reminds me of a beautiful colorful garden of lovely blooms,” Akerly said. The color brushes are made out of broom straw, either natural or plastic, and bound with a rubber band. The color, once it touches the size, spreads out like ripples on water. After all of the colors have been added, a stir stick is used to spread the paint evenly across the size in a pattern called a gel-git. From the gel-git, different patterns can be formed using a variety of combs and rakes. These include the Feather, the Peacock, the Birdwing, and the Thistle. 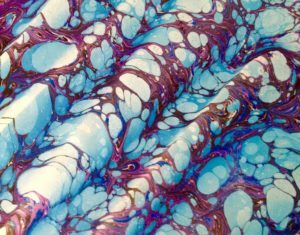 Stone marbling is a design created without using a gel-git. This is where the art form gets its name, as this creates a marble-like effect. This style can be used in conjunction with other combed styles to create a method known as fantasy marbling. Before the design can be transferred onto paper, the paper must be coated with alum. 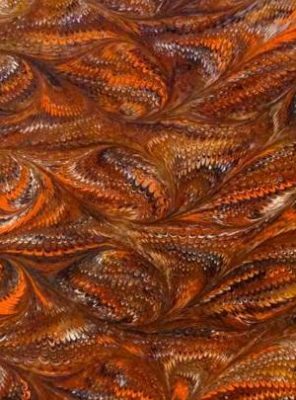 One of the most intricate marbling patterns, The Birdwing. “It acts as a mordant to hold the paint,” explained Akerly. This step allows the paper to be rinsed after and retain its pattern. Different methods of printing create even more interesting designs, such as the Spanish Wave. “It’s said a Spaniard had had too much to drink, and he went to work early the next day. His hands were shaking so much he made the Spanish Wave,” Akerly said with a smile. The paint pattern is transferred to the paper, and after rinsing off the excess color – voila! A beautiful piece of unique artwork is created. While the process seems easy enough, successful execution takes patience and practice, and the quality of the paint and paper are important factors in the success of the attempt. Akerly uses paper and paint specifically for marbling in her classes. “I want my students to always be successful, so I buy the best possible stuff,” she rationalized. Akerly’s boxes, books and paper are available at Glass Door Studio of Door County and libertygrovepaperarts.com.